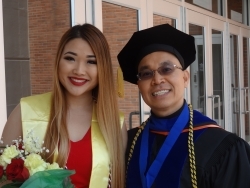 GRADUATION: Congratulations to Our Graduate Assistant Melody Li! With Melody Li, who’s just finished her 1.5-year tenure as Graduate Assistant for both EKU Women & Gender Studies (WGS) and EKU Asian Studies (ASN). Thanks for all you’ve done for our programs, especially for our budding Asian Studies Program. You helped make EKU ASN what it is today. Congratulations on receiving your master’s degree! Best of luck with your next journey!